Congratulations Becky! You are the winner of the Natural Bug Killer Giveaway! Becky wrote: "We had a cat die mysteriously once and I have always thought it was from chemicals that might have been on the ground outside that caused her death. It would be nice to know my kids and pet are safe from ingesting harmful products." There were a TON of creative ideas at last week's Penny Pinching Party. 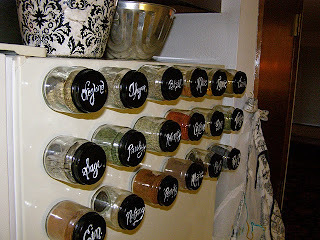 One of my favorites was by Little Apartment on the Prairie with her Baby Food Jars to Magnetic Spice Rack post. I thought this was a genius idea. Thanks for hosting again. I love the baby food jar idea. It looks great too. Thanks for hosting again this week! Can't wait to see all the great ideas! Thanks so much for hosting each week! That baby food jar thing is totally awesome!! Cool! I won! Let me know what info you need. I linked to your blog party and posted one of your buttons to my blog, but couldn't get your button to attach directly to my post. Okay, as creepy as my toes look...I still think it's kind of funny... I have a warped sense of humor! I sure do LOVE your blog, by the way!! !